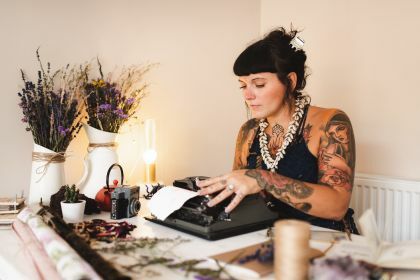 Warwick typewriter artist “Say It With Type” is giving something back by donating all profits of her range of handmade art to the Birth & Babies Appeal. Say It With Type’s founder, Rebecca Rimmer, is seven months pregnant and hopes to have her baby at the Bluebell Birth Centre early next year. The 40 new typewriter artworks “The Pregnancy hearts” represent the 40 weeks of a woman’s pregnancy and feature inspirational quotes intended to give mums-to-be strength in what can be a very challenging journey. Quotes include ‘I will take this one day at a time’, ‘Worrying has no positive purpose’, ‘Confidence will defeat fear’, ‘My body was made for this’, ‘Belief in myself is all I will ever need’, and more. The Birth & Babies Appeal launched in April 2017 and thanks to the generosity of the community over £170,000 has been raised so far. Specifically-designed midwife-led units like The Bluebell Centre at Warwick Hospital lead to less intervention during birth due to their relaxing and well-thought-out environments. All donations enable the centre to provide a home-from-home setting with specialised birth equipment like birthing pools and slings. The quotes on the artworks have been written with pregnant women and their mental health in mind, but many could be enjoyed and appreciated by those not on the journey to being a parent. Local Warwick florist Green and Wild have supported the project and kindly donated the flowers used in the pieces.